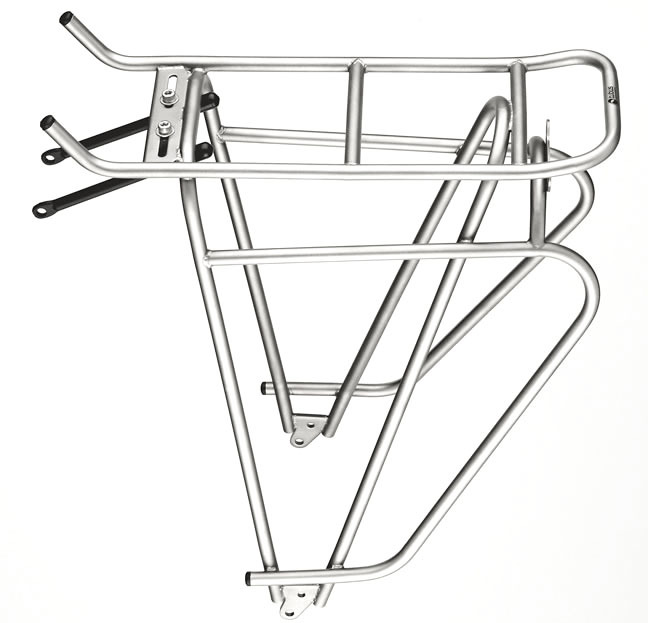 Tubus racks are either brazed with chromoly steel tubing, or welded with stainless steel tubing. 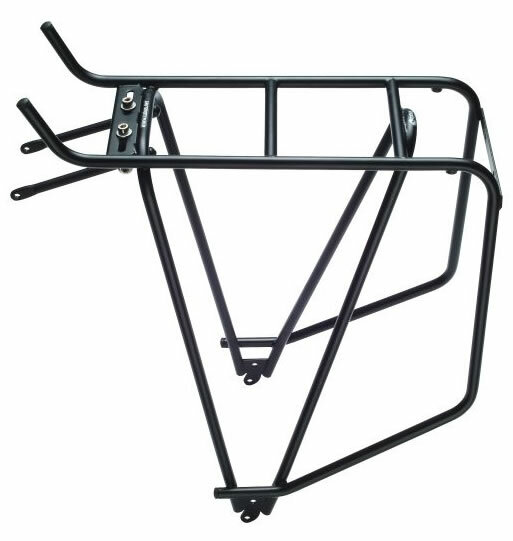 The chromoly racks are very strong and durable, and light weight. The stainless steel racks (Cosmo and Luna) are heavier, and have lower maximum load capability, since stainless steel is not as strong as chromoly steel. But they look awfully nice, and they won't rust. The rear racks are all triangulated. If you view them from the rear, all the struts on the "Fly" and "Luna" and the center struts on the "Cargo" and "Cosmo" angle inward toward the top, making for an extremely stiff structure. This is the Tubus "Cargo" rear rack. It's made of tubular chromoly steel; weighing 18oz. The middle strut makes a loop from one dropout to the other. Viewed from the rear, it makes a triangle with the hub, making the rack extremely stiff. This is the strongest rear rack Tubus makes. There is an integral light bracket on the rear that accepts not only most American style battery taillights, but also European style generator lights, such as the Busch&Müller DToplight XS Plus. The mounting system accommodates a wide variety of frames. The Cargo is available in two sizes, one for 700c wheels, and a shorter version for 26". The Logo has a rear light bracket to fit European style taillights as shown. The taillight is not included, sorry. But I do sell them. The top is slightly narrower than the Cargo rack. The panniers mount lower resulting in a lower center of gravity, which some riders prefer. A second eyelet at the bottom makes fitting fenders very easy. It's built with tubular chromoly tubing so it's very strong. The Cosmo is similar in design to the Logo (see above), but the top extends out to the rear, so it's easier to stack things on top, and it helps protect your taillight. You do have a taillight, right? The Cosmo is a few grams heavier than the Logo, and is more expensive. But, in stainless steel, it sure is pretty. It's very strong with a load carrying capacity of 40 kilograms, or 88 lbs. It has a taillight bracket, and as with the Logo and Cargo, the taillight is not included. We stock several taillights to fit. The taillight in the photo is the Busch & Müller DToplight XS Plus, wired to a B&M headlight, powered by the Schmidt dynamo hub. There are also several battery powered taillights that fit this rack. On this frame, a Rivendell, the eyelets on the rear dropouts are very closely spaced, so I used the rack itself to mount the fender struts. It's nice to have options. We now only have this new version of the Cosmo. There was an older version, which has the exact same shape as the Logo, seen above, but made with stainless tubing. The older version is no longer being made. But I really like the way this new version protects the taillight from bumps. It's less likely that anything placed on the top of the rack might press down onto the light. 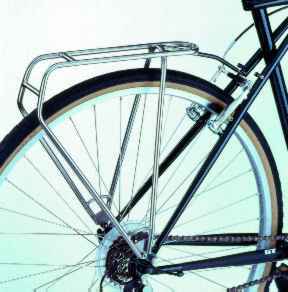 The Tubus "Fly" rear rack is a minimalist design. 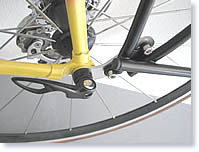 A single adjustable and bendable forward strut attaches to the seat stay or brake bridge. 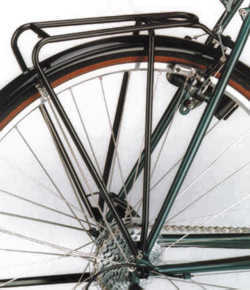 The top of the rack is quite narrow, placing the panniers as close as possible to the center line of the bike. Not suitable for use with top mount rack packs. Similar in design to the Fly (see above), the Luna is welded from stainless steel tubing. It's a bit heavier and has a lower carrying capacity. Like the Cosmo, it's reason for being is it's looks. The Vega is identical to the Logo, but without the lower side tubes. It's a minimalist design, much like the Fly, but designed for frames with eyelets on both seat stays. It's very strong as it's built with chromoly tubing and powdercoated black. You can attach a rear light such as the Busch & Müller 4DToplight Permanent in the photo. 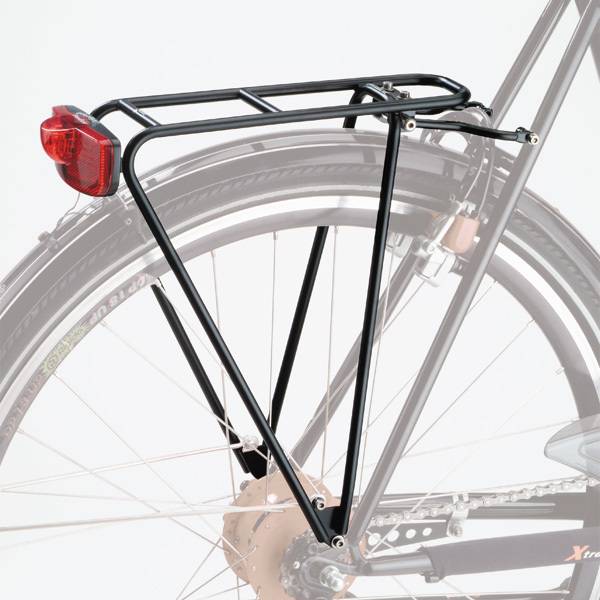 The taillight is not included with the rack, but we have plenty in stock as we are the US importer for Busch & Müller. We have both battery powered taillights and dynamo powered taillights. The Vega has extra eyelets for mounting fender struts. And it's compatible with the Tubus QR Adapter for frames without dropout eyelets. For commuting with a Carradice Bike Bureau or Ortlieb Office pannier, the Vega is ideal. 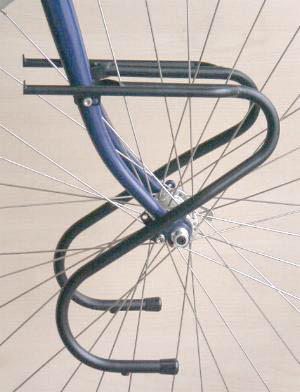 for rear dropouts without eyelets. What do you do if your frame doesn't have eyelets on the rear dropouts? Tubus makes a nifty adapter. It uses a quick release skewer to clamp a bracket that you can then use to mount your rear rack, if it's either a Tubus Logo or Tubus Cosmo. Once installed, removing your rear wheel won't be as easy. 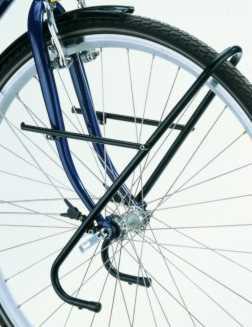 And you'll not want to have your panniers mounted when you do remove the rear wheel since the weight will then be supported completely by the upper rack struts. But it's a secure way to mount a rack on a bike that was not intended to have a rack. 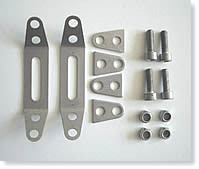 If your frame doesn't have eyelets up above the brakes on the seat stays, you can use these stainless steel mounts to attach the upper struts of your rear rack. The picture on the left shows the hardware as it comes to you. The two long pieces on the left are bent around the seat stay, as the picture on the right shows. The little sort of triangular pieces reinforce the end tabs of the long pieces; you can see them on the right hand picture. When assembled correctly, they make a very strong and durable mount for the upper struts of the Tubus Cargo, Cosmo, or Logo rear rack. You'll need to measure the diameter of your seat stays so we can send you the correct size. There are five sizes; 14mm, 16mm, 19mm, 22mm, and 25mm. We stock them all. If your seat stays are in between sizes, use the next larger size, and use a shim to make up the difference. 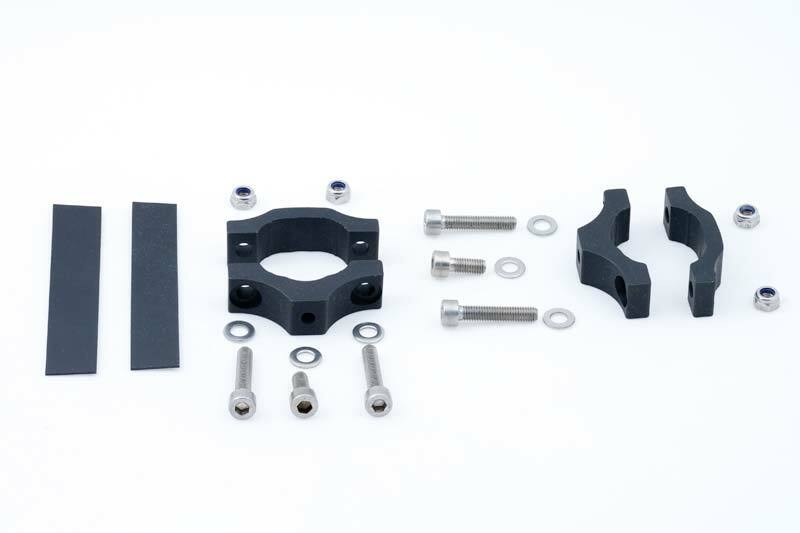 If your Tubus Cosmo or Logo rack isn't high enough to clear a big 700c tire and fenders on your frame, you can raise it with these adapters. They bolt to the two holes at the bottom of those two racks (only those two, no other racks have two holes positioned the same), and then to the dropout eyelets. These work only with the Cosmo and Logo racks. They cannot be safely used with any other racks. There are two ways that bicycle manufacturers make braze-ons for front lowrider racks. One way is a tube brazed into each fork blade allowing a bolt to extend all the way through the fork blade. The other way is to braze in a threaded eyelet, much like a water bottle braze-on. Tubus makes front lowrider racks to mount to both types of fork. If you can put a bolt all the way through the fork you can mount the Tubus "Duo" front rack. 11.2oz. Maximum load, 33 lbs. If the mount is threaded and on the outside of each fork blade, you can mount the Tubus "Tara" front rack. 11.5oz. Maximum load, 33 lbs. 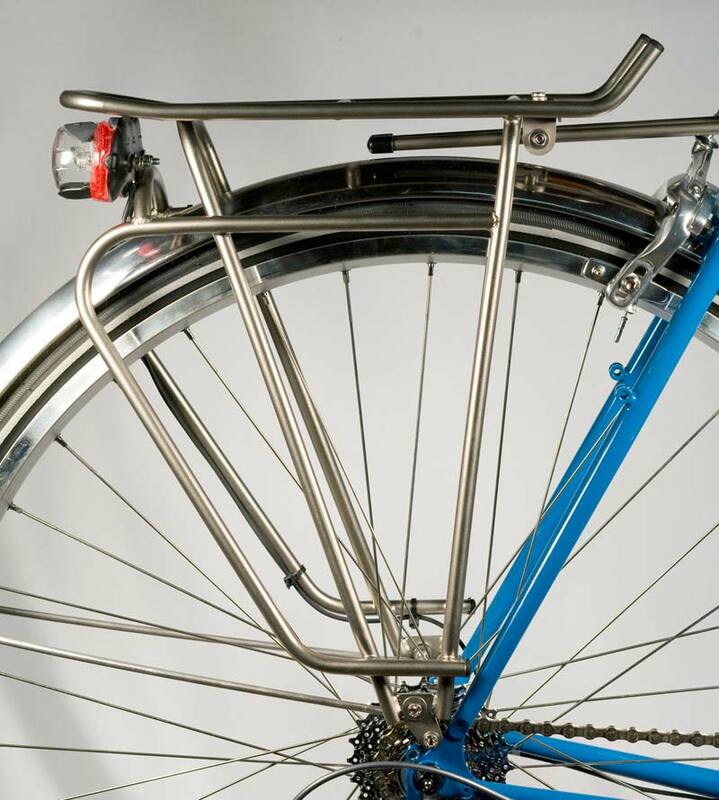 If your fork has no mid fork eyelets, you can still mount the Tara rack, as long as the dropouts have eyelets. Tubus makes a nice adapter for the mid fork. 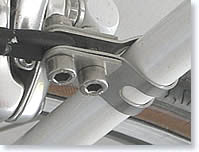 The Tara bolts to the center holes in the clamps. Available in two sizes: 20mm to 32mm diameter, and 25mm to 40mm diameter. So now that you have a Tubus rack, what are you going to put on it? Perhaps an Ortlieb or Carradice pack?